By Rebecca Nickols on August 17, 2012 Visit Rebecca's Website. Once again I’m on my quest to find the most creative, unique and just down-right “cool” coops. This month I think I might just have stumbled upon a collection of awe-inspiring coops that are in a class all their own! These one-of-kind coops are located on Whidbey Island (about 35 miles north of Seattle,Washington) and designed and constructed by Bob Bowling of Bob Bowling Rustics. Although he doesn’t have a storefront, his work can be seen Saturdays at the Bayview Farmers Market and at the Northwest Flower & Garden Show each year in Seattle. Bob’s sheds, coops, greenhouses and outbuildings evolved after the rustic-styled birdhouses he made proved to be so popular. Each structure is constructed of a solid new framework then finished off with recycled wood and materials resulting in a truly unique work of art! I absolutely love the thought, detail and craftsmanship that are present in every minute aspect of these coops! I’ve always heard that one man’s trash is another man’s treasure, but it takes a special talent to take salvaged items and create something as eye-pleasing as these structures. Bob says that his customers tell him that their happy chickens lay better eggs!–I can’t imagine a chicken that wouldn’t be happy living in a such an awesome coop! All photos courtesy Bob Bowlings Rustics. 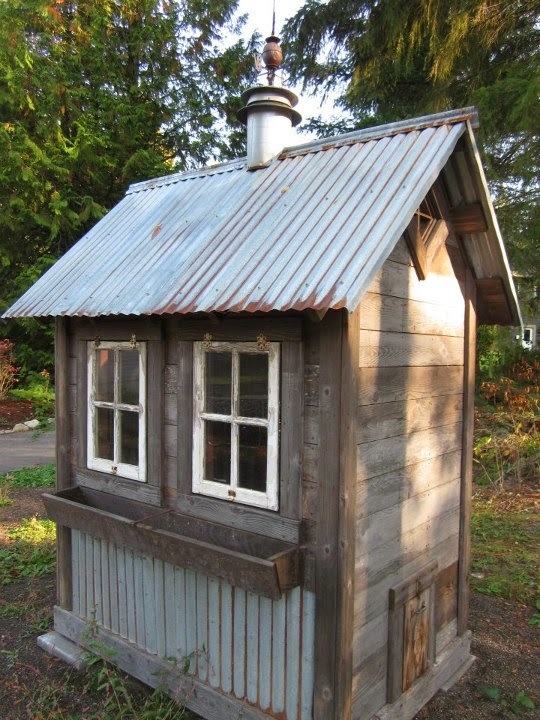 Do you have a “cool coop” you’d like to share? Email me at rebeccasbirdgardens@gmail.com. what a shame these are so far away! I really love the look of these coops!! Cute coops only thing I see I didn’t care for comes from experience is don’t hang the roosting pole above anything you don’t want poop on. In the one pic. it over part of the nest box. I had one hen roost on top of the wire box covering the heater what a mess. Keep up the good work. I love these coops! Hope to see more!! The coop on cement, shown in the photo, is being readied for delivery. It found its home in Kirkland, Washington in an urban backyard. The other coops are generally set on pavers so that the moisture from the ground doesn’t ‘wick’ into the wood. So happy that you like the coops! Thanks for checking out our website! What creative beautiful coops! Your are an inspiration! Thanks for the peek! Some of the most beautiful coops I’ve ever seen! I love the rustic look and the unique designs! What a great idea! They are beautiful but I noted some of them were on cement floors. We found that with a moveable trolley, when we moved it to mow grass, the rain washed down the droppings in the previous spot and we had the most beautiful grass! Harvesting the droppings and using them as fertilizer is one of the benefits of having them as yard birds! Very nice. I like the idea of recycled and re-purposed material. Thanks for sharing the photos!